America’s big generation is heading into its next big phase of life. By 2030, baby boomers will be 65 or older and will constitute 20 percent of the U.S. population. That’s a lot of retirees. The report concludes that “in the near future, it will become increasingly unusual for retirees not to work.” Driving forces cited in the study include increasing life expectancy, elimination of pensions, economic uncertainty and the re-visioning of later life towards purpose and social engagement. Couple this with the stark reality that 22 percent of boomers have less than $100,000 of retirement savings -- and half of those have less than $50,000. It’s no wonder that 62 percent of younger boomers (ages 51 to 65) expect employment to be a source of income in their retirement years. Bohnne Jones of Nashville, Tenn., fits both categories. After 31 years in health care, she was downsized five times between 2002 and 2007 -- until she turned to something completely different. 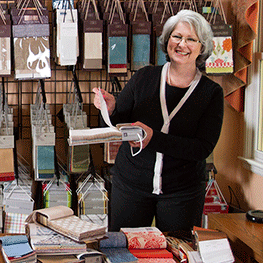 “I was looking to own my own business and work pursuing my passion for design, fabrics and color.” Jones found her answer in the Decorating Den Interiors franchise that she has owned in Nashville for the last eight years. The advantages of buying a franchise include built-in name recognition, proven business models and operational procedures, and a wealth of support from the franchisor in locating, supplying and marketing the business. Jones used her own retirement assets, through an arrangement called Rollovers as Business Startups, to buy her franchise just before the onset of the recent recession, and the educational materials and low-cost marketing ideas provided by Decorating Den helped her weather the storm. Although all franchises require an initial investment, those worried about the lack of sufficient savings can still find franchises that don’t necessarily require large upfront payments or high net worth. Low-cost franchise options include commercial and residential cleaning services, printing and promotional products, tax preparation and a variety of services for children or seniors. SBA loans may also offer a source of financing. And buying an existing franchise from a current owner -- as opposed to building a new franchise location from the ground up -- can give an entrepreneur more certainty when making a business investment. As with any undertaking, do your research and consult a trusted financial advisor to see if franchising makes sense for you. Franchising can help baby boomers match their interests, their entrepreneurial spirit and their specific financial situation to a business they can build on -- with help and guidance from the franchisor, franchise associations and their fellow franchisees.